BlackRadioIsBack.com & the FuseBox Radio Broadcast Supports the University of Maryland's March Madness Benefit Cypher! | BlackRadioIsBack.com - Official Blog of the Syndicated FuseBox Radio Broadcast! BlackRadioIsBack.com & the FuseBox Radio Broadcast Supports the University of Maryland's March Madness Benefit Cypher! 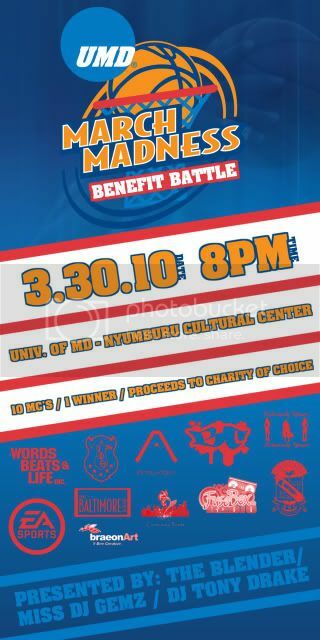 88.1 FM WMUC (University of Maryland - College Park’s Radio Station) will be hosting March Madness Benefit Cypher, an emcee battle, on Tuesday March 30, 2010, from 8-10 PM in conjunction with several student organizations on campus (Black Student Union, Community Roots, Iota Phi Theta Inc., etc.). Grind Time Now, the world's #1 Rap Battle League is also helping to promote the event. All proceeds from the event will go to the non-profit charity of the winner’s choice (with confirmed 501(c)(3) status). The money will be provided directly to the charity from the University of Maryland, College Park. Much appreciation and respect due to WMUC 88.1 FM DJs Miss DJ Gemz and DJ Tony Drake for giving us the heads up about the event and being a part of everything - definitely check them out when you can!